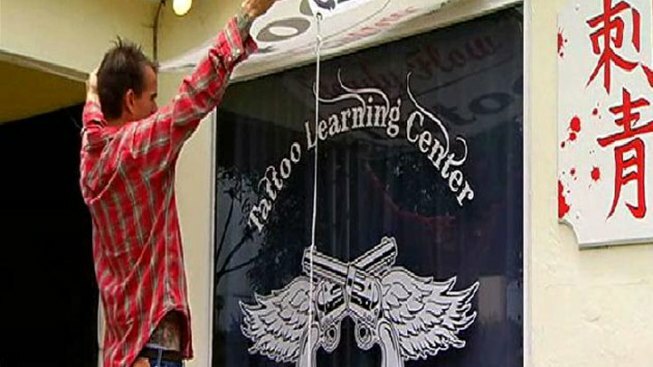 Local tattoo artists are protesting a new school in Pacific Beach that plans to teach people the art of tattooing in two weeks. The group stood outside the Steady Flow Tattoo shop, also known as the Tattoo Learning Center, at Grand Avenue on Monday, protesting what they believe is an insult to their profession. The protesters became aware of the shop after learning the school would be featured on a new show on The Learning Channel, called "Tattoo School." Janson said if the show airs, he fears this type of school could become a popular trend. "We are all here, basically trying to bring public awareness to the fact that as an industry, we feel that we are sort of being stepped on," Janson said. One tattoo artist says a standard apprenticeship is one to two years, and it takes several years after that to develop confidence as an artist. "It took me four years until I got the hang of it," said tattoo artist Marc Beccia. "You take someone under your wing, you have them work side by side with you," said Janson, who is Beccia's mentor. "You teach them one thing at a time; it's baby steps." Beccia and Janson, along with several other artists, stood outside Steady Flow. Read a statement from Tattoo Artist Magazine about TLC's new show "Tattoo School." One of the school's students and two women interested in getting a tattoo at the shop watched the group with a bit of concern. The student said he flew to San Diego from out of the country and was told when he arrived that his two-week class was canceled. The man, who wishes to remain anonymous, said the school told him to enjoy his free accommodations and that his tuition would be refunded. He said the shop owner told him to drive by the storefront to check it out and stumbled on the crowd growing outside the shop. The student said he is already a tattoo artist in his home country, but he had hoped to come to the United States to become a licensed tattoo artist. In San Diego, you only need to fill out an application and pay the appropriate fee to be able to practice tattooing within the county limits, according to the County of San Diego's Department of Environmental Health's website. Two young women interested in getting tattooed were also standing outside the shop amidst the protesters. They said they spoke to someone at the shop earlier in the week and were told they don't take appointments; rather, they should simply stop by. When the girls arrived, they found the shop closed. After a second phone call to the shop, they learned Steady Flow would be closed for two weeks. Janay Benson and her friend Lil' Bit were recommended by a friend who already received a tattoo at the shop. "Hers looked good," Benson said. She added she wasn't concerned about students giving her tattoos. "I'm OK, as long as the needles are clean," Lil' Bit said. Phone calls to the Tattoo Learning Center and The Learning Channel were not returned.